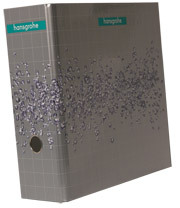 Custom Binders: 4-color digital processing let’s you save on short run orders! Academy now offers digital printing for orders of less than 200 binders. With digital printing you can eliminate costly set-up charges and costly press fees and save hundreds of dollars on your order. These prints can be used in our vinyl binders, with a clear overlay, or a turned edge laminated binder. Both the vinyl and turned edge binders can be customized by size, additional foil stamping, screen printing and interior pockets and ring sizes. 4-color digital processing is a great value for your customers, prospects, employees, students, members, or partners –and exceptional format for your next presentation, proposal, production, promotion, project, event, company kick-off or gift.